Join The Putnam Dance Center’s Competition Team! Students at The Putnam Dance Center have been competing regionally and nationally since 2002. Our competition dancers have not only made connections to last a lifetime, but have improved in their technique, performance skills, communication skills, and work ethic. 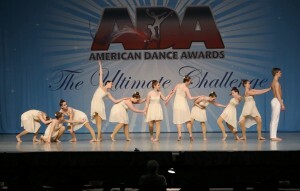 They have learned to work together as a group for a common goal, one of the best life experiences dance can offer. In addition to this, competition has provided excellent opportunities for dancers to test their skills with other dancers from around the country. 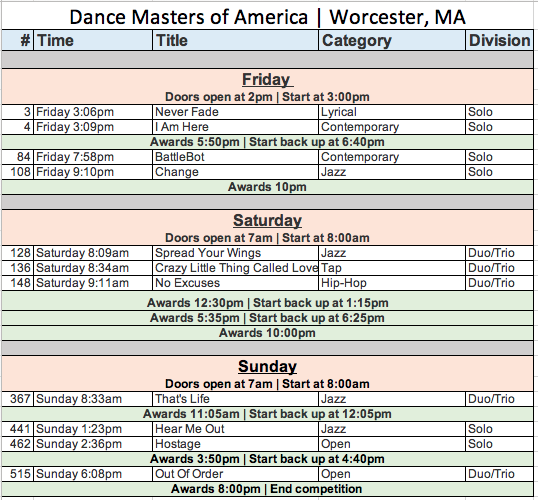 We have had numerous routines place first overall, obtain titles, and receive judges awards. Check out some of our accomplishments over the years here! One aspect The Putnam Dance Center values immensely in competition, is that it is not the size of the trophy, or the color of the medal that matters. There are so many factors that go into award placement, and it is extremely important to us that our dancers not only recognize their own growth within themselves, and their dance, but also appreciate the experiences and memories that they are creating. Competition is an opportunity to learn more about yourself as a performer, get feedback from professionals in the field, and connect with others in the industry. We hope that you’ll join the team! Dancers have the opportunity to learn from not only their choreographers, but also from locally, nationally, and sometimes internationally accredited judges. It is through these experiences that the students are able to hone in on their technique and performance skills to learn as much as they can while having fun performing on stage! 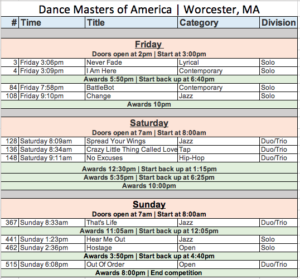 This is done through video/audio feedback, written feedback, and scoring amongst other dancers from other studios. Also, various competitions will have conventions where dancers will be able to take class from well known teachers, have the opportunity to earn scholarships, and learn from watching other dancers their age. In addition to gaining feedback on their dancing, students are able to be a part of a closely knit team that supports each other through thick in thin, giving them the opportunity to make life long friendships. The level of responsibility in the competition dancers often grows as well, as they are responsible for being prepared, remembering choreography and notes, being on time, and being a team player. It is a great way to strive to be the best you can be as both a dancer and a person! The Putnam Dance Center competition team students have the opportunity of performing more than just in the recital. In addition to the regional and national competitions we attend, every year we hold our annual “Dance and Dessert.” This event serves as a fundraiser for the team, but also gives our students the chance to perform their numbers on stage before competing them. Often, friends and family are not able to travel with us to competition which makes this a great opportunity for our loved ones to see us perform! Our dancers have also performed in events such as the Woodstock Fair, and in various nursing homes in the surrounding area. 2 Ballet, 1 Jazz, 1 Modern, 1 Conditioning, Dance Education, and (if different) a class in the style in which they are competing. 2 Ballet, 1 Jazz, 1 Conditioning and (if different) a class in the style in which they are competing. 1 Ballet, 1 Jazz and (if different) a class in the style in which they are competing. Students should be available for Saturday and/or Sunday rehearsals. This is Natalia’s 2nd year on The Putnam Dance Center’s Competition Team and 11th year dancing at the studio. When she isn’t dancing, she loves to read and write about WWII, and listen to music. But if you happen to run into her at the mall, it will probably be at Bath and Body Works! 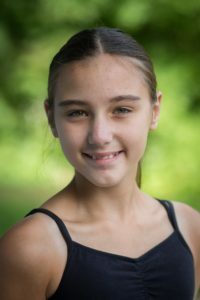 Performing lyrical routines is one of Natalia’s favorite styles, and she will be doing a lyrical solo this year called, “Never Fade,” choreographed by Jennifer Paquette. 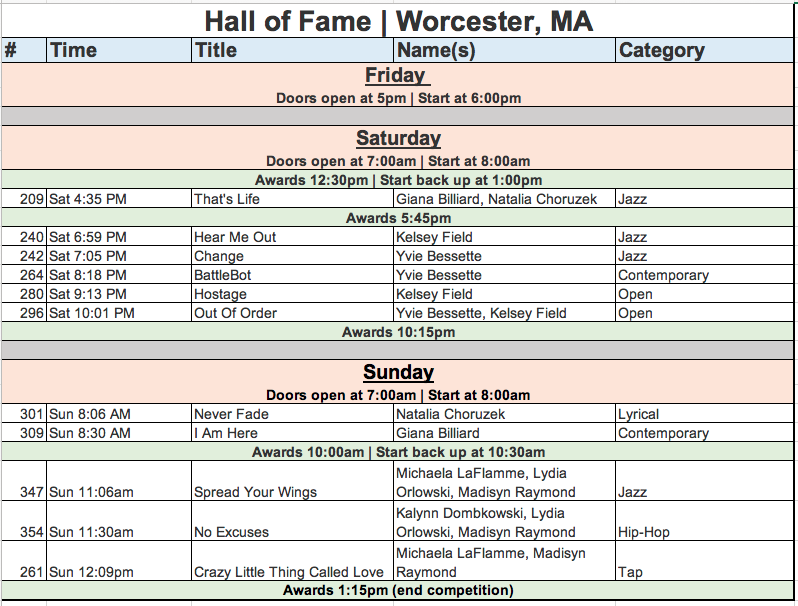 In addition to this, she will be doing a jazz duet with Giana to “That’s Life,” choreographed by Kelsey Rioux. 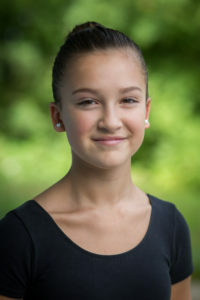 This is Giana’s first year on The Putnam Dance Center’s Competition Team and 9th year dancing. 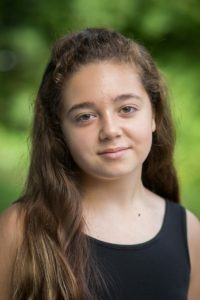 When Giana isn’t singing or dancing, you can usually find her acting in plays, babysitting, hanging out with friends, listening to music, or traveling. Did you know she’s been to 19 of the United States?! Contemporary dance is a style Giana loves. 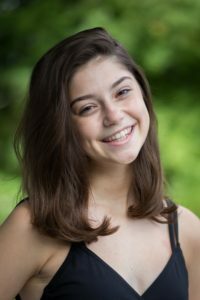 This year, her solo choreography by Jennifer Paquette is a contemporary piece titled, “I Am Here.” Giana is also performing a jazz duet with Natalia titled, “That’s Life” choreographed by Kelsey Rioux. Michaela has been dancing for 4 years and is joining the Competition Team for the first time this year. When asked, “What would you like to be when you grow up?” Michaela states, she would like to be a professional dancer! In her free time, Michaela enjoys playing with her bunnies and chasing the goats (she’s definitely an animal lover!). She also plays on her saxophone, bakes, draws, and spends time with her friends playing sports. 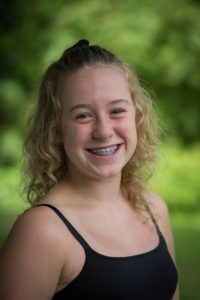 While her favorite style is modern, Michaela will be performing a jazz trio choreographed by Kelsey Rioux called, “Spread Your Wings,” and a tap duet with Madisyn called, “Crazy Little Thing Called Love,” choreographed by Danielle Duquette. This is Kalynn’s first year on The Putnam Dance Center’s Competition Team, and 5th year dancing at the studio. In addition to dancing, Kalynn loves to play softball, read, and do hair. Did you know she received All-Stars for softball? She is certainly a talented girl! This year on the Competition Team, Kalynn will be performing a hip-hop trio titled, “No Excuses,” choreographed by Sabrina Yachkouri. While she loves hip-hop, Kalynn is also really interested in contemporary dance because it lets you express emotion and technique. Madisyn Raymond has been with us for 10 years, and this is her first year on the Team. Usually, she is at dance or cheer (which she’s been doing for 7 years now! ), but in her free time, Madisyn can be found reading, spending time with her friends or listening to music. 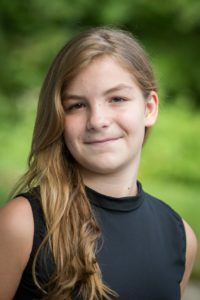 Madisyn dances many different dance styles at the studio, but her favorites are jazz and modern. This year, she will be competing a jazz trio titled, “Spread Your Wings,” choreographed by Kelsey Rioux. In addition to this, she will also be performing in a tap duet with Michaela, and a hip hop trio. These numbers are titled “No Excuses” by Sabrina Yachkouri and “Crazy Little Thing Called Love” by Danielle Duquette. 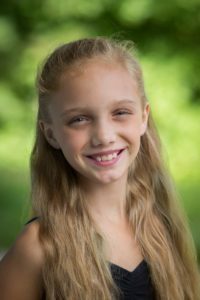 Lydia has been dancing with The Putnam Dance Center for 6 years and is joining the Competition Team for the first time. In addition to dancing, Lydia and her mom do wildlife rehabilitation which has been a huge part of her life. It’s not a surprise she wants to be a veterinarian one day! She also loves art and has recently picked up wood burning. Dancing has always been Lydia’s passion, especially contemporary and modern because it is so original, and you can do so much with the movement. 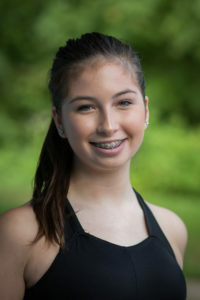 You may find her dancing these styles in the recital, but for the competition team she will be performing in a Hip Hop trio titled, “No Excuses,” choreographed by Sabrina Yachkouri and a jazz trio titled, “Spread Your Wings,” choreographed by Kelsey Rioux. Yvie has been dancing for 14 years, 3 of which have been on the competition team. One of Yvie’s favorite styles of dance is contemporary because it allows you to express yourself physically and emotionally. In this style (and a few others), she has won numerous judges awards at competitions, and has placed in 1st, 2nd, and 3rd at various regional competitions. Kelsey Field has been on the competition team for 9 years, and has been with us at the studio for 13 years. Kelsey has always loved dance since she started at a young age, giving her many memories to look back on, one of them being her first competition. While on the team, Kelsey has received numerous judges awards and received 2nd overall for her and Yvie’s self choreographed duo last year. This year on the team, Kelsey will be performing in 3 routines. She will be dancing a jazz solo titled, “Hear me out,” choreographed by Kelsey Rioux, an open solo choreographed by SKooJ CorE-O titled, “Hostage,” and an open duo with Yvie titled, “Out of Order,” choreographed by SKooJ-CorE-O.